Traditional marketing involves custom logo designs, billboards, brochures and trade show displays. These days, though, they serve as additional efforts for online marketing. A billboard will often tell consumers to go to a company's website and upon visiting it, they'll be asked if they want be part of the company’s email list. A June 2016 survey of US marketers found that email had a median ROI of 122%, higher than other channels examined, including social media, direct mail and paid search. In their annual report for 2016, Campaign Monitor put the number at $44 in ROI for every dollar spent (up from $38 in the previous year). 1. Start with permission marketing. Instead of buying a database of email addresses, build your own mailing list by giving customers the choice to opt-in and opt-out. Let your website visitors subscribe to your emails. At events, print out a sign-up sheet where people can write their email addresses. And, in your emails, provide links for customers to opt-out. Permission marketing isn’t only fair to your receivers. It’s fair to you too because your emails will get to leads who are properly targeted. Let’s say you have website visitor named Sheila. She’s over 30 and she’s an HR trainer. Her sign-up for your website’s newsletter means she has some level of interest in buying. 2. Get personal. Emailing is a form of communication. It’s a great way to get personal with your subscribers. Build a relationship by introducing yourself in a friendly way and calling the subscriber by first name. And periodically remind them that they opted-in by mentioning what event they went to where you got their email address, for example. You'll be surprised at how responsive your subscriber can be. Whether it’s clicking on a link to an ebook, in the early stages of the buying process, or actually writing to you about her business situation, in the later stages. These replies will help you choose better content for Sheila. Limit to three typefaces. Using more will make your email look cluttered. Put your logo on the left. People focus on the left side when reading online. Include alternate texts for images and html versions for the email. Sheila will have the option to read these much simpler versions. 5. Design your emails to be consistent with the landing pages. The landing page is where your subscriber can perform the action that you asked. In our running example, it's where Sheila can register online for the workshop. Making the email reflect the text and the design of the landing page is important because 1) it reflects the company’s branding and 2) it lets the subscriber know that the action she did is a continuation of what she had just read about. 6. Test your emails before and after you send them. You can do a blink test aka the 5-second test before you hit send. You may have heard of this before: Get your best email studies and your colleagues look at them. Ask them which one catches their eyes first. You can also do an A/B test after. Divide your mailing list in two and send them 2 different designs. Tracking tools from Hubspot, Salesforce and Google Analytics will help you determine which design got more responses. 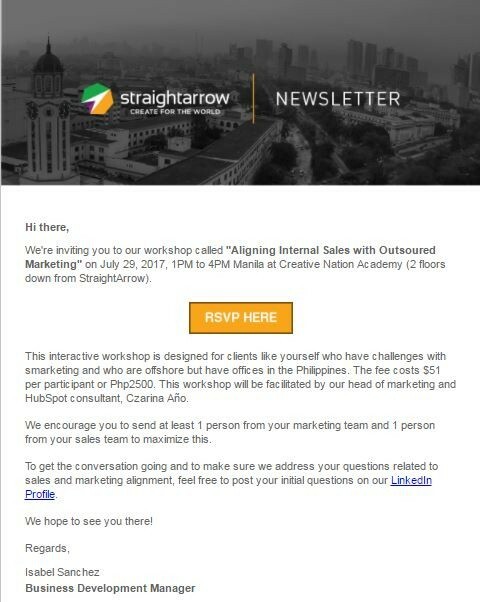 From here on, it’s a matter of refining your choices for content and design based on your mailing list’s response. Soon, you’ll have built a great business relationship with subscribers like Sheila who will eventually become a valued customer. 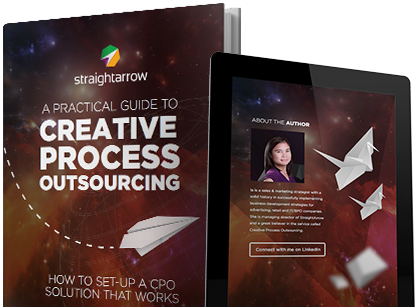 is an Inbound Marketing Specialist at StraightArrow Corporation. 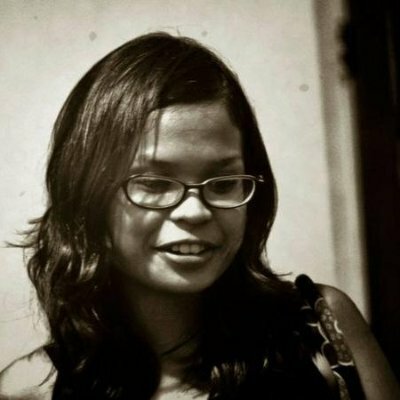 She is also a poet whose works have appeared in Philippine and U.S. literary publications. She runs a blog on regional arts and culture while experimenting in the kitchen, jogging around the city and collecting unicorns -- in marketing and in toys.